Hi guys! Today I’d like to talk a bit about how and why I learned to love eBooks. Story time: I used to be rather anti eBooks. In my mind, nothing could beat actual physical books. And what’s not to love about them? They feel good in your hands. They look good on a book shelf. They smell good. They are more photogenic than people and perfect for bookstagram. Opening book mail feels like a party. They make a perfect gift. They make perfect heavy self-defence weapons. I mean, the advantages of physical books are plenty, while an eBook is just… bleh. At least, that’s what I USED to think. Lately, my eyes have been opening to the wonder of eBooks. They definitely deserve a lot more credit. So why not share my new-found knowledge and list some of the reasons why eBooks are actually quite rad too? So where does one get books then? The library? Possibly, but here again: not everybody has access to big libraries. And not all libraries have a huge selection. A solution could be to order books online from sites like Amazon or BookDepository. But then you have to make sure that A) they actually deliver to your country and B) the shipping costs are not INSANE. THE SOLUTION: EBOOKS. No need to drive for hours or go on epic quests to get a book. A few clicks and you have all the eBooks in the world available to you through Kindle or iBooks or any platform of your choice. Definitely another big pro for eBooks. The truth is, books are expensive. Especially for hardcovers. I love the look of a hardcover book. They’re dreamy. BUT they can be double the price of a paperback, which is crazy. And eBooks are still cheaper than paperbacks as well. So if you’re short on cash but still really want or need a new book, an eBook is probably your best bet. And if you keep an eye out for it, you can score some really nice deals as well. Bonus: chances are you can get more books for the same budget. Isn’t that dreamy? Imagine this scenario: you have been anticipating a certain new book release FOR AGES. You have it pre-ordered. It comes out today. You can’t wait for your package to arrive. You are seeing other people on social media posting pictures about their book that has just been delivered. Cool, you’re excited for yours to arrive as well. Then you get a mail that your delivery has been delayed. You need to wait a few more days. Ok, you can do this. What’s a few days, right? But then other people are reading the book before you. And finishing the book. And posting SPOILERS all over the internet. And still you have no book. How to avoid this scenario of doom? That’s right: get the eBook instead! No waiting at all, it’s delivered right away and you’re good to start reading! I must admit, part of me still loves and prefers physical copies. But when my bookshelf starts overflowing and the piles of books all over the house are starting to take dangerous proportions and my proposal to replace all furniture in the house with books is met with quite some resistance, it’s time to get creative. And by creative I mean: switch to eBooks for most books. I still buy some physical books, but only those must-buys, the books from series or authors that I feel a need to have on a shelf to be petted and adored. (And the occasional splurge when I am weak, because I am just weak, very weak) ALL OTHER BOOKS: I’m sorry but you’ll be an eBook. What does this matter, Lindsey? IT MATTERS A LOT! I always like having a book with me. Preferably even several books, because I’m a mood reader and who knows what I’ll be in the mood for? I need a fluffy romance book with me, I need a fantasy, I need a sci-fi. And what if I’m almost at the end of a book? I need another one with me just in case. So this can get rather heavy. My bag is already chosen based on how much fits in it, not looks or style or comfort. Sure, it can be used to knock someone out if necessary, but if my arm has already fallen of from the weight it won’t be that helpful either.. So once again, eBooks are the solution! No matter how many you take with you, they will always weigh exactly the same. I had an epiphany when I realized that my Kindle app works on a tablet AND on my phone. Because a phone is so small and a big part of every-day life, right? People don’t look twice if you’re on your phone. The weird thing about society today is that if you would take out a book in a social situation, people would call you asocial. They’d ask you to put away the book. But a phone? Everybody is on their phone and it’s considered normal. So reading on your phone? SNEAKY BUT POWERFUL. Handy to avoid social situations if you are so inclined, but also just to fill those dead times spent waiting on a bus or an appointment. Which of course also means you can find more time to read, which means you can read more, which means you are one step closer to conquering that TBR pile! I’m a big fan of quotes and always like to remember my favorite quotes and use them in my reviews. But for physical books this is a bit of a problem because I need something to mark the book. I’d rather not damage my book so highlighting or folding the page is out of the question. Sure, I could use post-its, but I don’t like the looks of them either (yes, I’m very picky about the look of my books) and when I need them they are never within reach. So I figure I’d do it later, but when it’s later all memory of said quote has already left my mind. Ergo: quotes get forgotten, lost in the great unknown. But my Kindle app has this handy little function to highlight quotes, which has made my life infinitely more easy. I can highlight quotes, find them back immediately AND copy them all at once and send them to myself for easy copy-pasting into a review. Talk about efficiency! But forget terrible covers, how about the big things? Like for example an LGBT kid who wants to read an LGBT book and is in need of discretion? Even though I’d like to imagine the world as a safe, supportive place for everybody, unfortunately this is not always the case. So in these kinds of situations, the discretion of eBooks could be really welcome. This is an advantage mostly for book bloggers, but I think it’s a pretty big one. Sure, every book blogger would love to receive pretty physical ARCS from publishers. But not every country is home to a division of that publisher. Which of course means that book bloggers from said country are less likely to receive any physical ARC. Shipping costs would just be too expensive. Luckily there are eBooks, which don’t come with shipping costs and are the savior of international book bloggers around the world! So that is it. Nine reasons that made me fall in love with eBooks. Of course I still love physical books as well, but I have learned to balance physical books and eBooks. How about you? Do you have a preference between eBooks and physical books or do you appreciate both? Do you see any other advantages for eBooks I missed? Physical books are definitely more photogenic and so exciting to get in the mail! But I love ebooks. I find them easier to read since I can hold my kindle with one hand, can read lying down in bed in the dark (my favorite place to read), and can read them anywhere I go since I also have the app on my phone, which allows me to get more reading done. I also save TONS of quotes, and yeah, it’s a real pain trying to save quotes with physical books. I end up using bits of paper to bookmark the pages, but you can’t copy and paste like you can with ebooks! And of course ebooks are less expensive, which the biggest advantage to me. I could never afford to read as much as I do if I bought all physical books! Oh yes, you are so right about ebooks being easier to read! I also love reading in bed but it is so tricky to find a comfortable position to read a physical book. ESPECIALLY when it’s cold and I’m also trying to stay as much under the covers as I can 🙂 Ebooks defintely solve that problem! I love ebooks. I am the opposite that my world has opened up to physical book more lately lol. Still I love my kindle and ebooks because I can read anywhere and I read faster. Plus like you said they take up less space, are cheaper and have better sales and I always read on my phone when I get a minute!! But I will take any kind of book I can get 🙂 Great post!! I’m still physical books all the way! But – I totally see the advantages to ebooks, especially when on our last vacation, I had three paperbacks with me and almost finished them, which would have left me with nothing to read. If I had an ereader, I could have brought more books without taking up so much room in my carry-on! OMG yes, I totally relate to the vacation problem! I also always like to have 3-4 books with me, and then I worry it still may not be enough and what would I do if I ran out of books to read? 😀 That’s definitely a situation where ebooks are really handy! I love this! I’m def down with ebooks. I take my iPad on vacation, to work, everywhere. And I love that I have multiple books at my fingerprints. It can be a little hard on my eyes sometimes but I just remember to take breaks. I love that I can have some many ebooks handy on one device! I love this so, so much, Lindsey! That first point is so true, and I’ve experienced it firsthand because I just spent seven years in a first-world country and have just returned to my home country, and the difference is SO stark. I had libraries in Australia and physical bookstores were everywhere, so it was super easy to get access to physical books, but now in Indonesia I’m not even sure if we have libraries (OK I think we do, it’s just not really used/well-stocked) and the bookstores really only publish very mainstream/popular fiction. So… you’ll be able to find big-name authors like Veronica Roth, but not smaller debut authors like, say, Angie Thomas, even if the book I want to read is the latter’s book. E-books have definitely been very, very helpful in that sense. This is my favourite post of yours till date. I laughed so hard at the GIFs omg, great GIF selection! I buy ebooks because if a book is released in paperback, then only it is available in India, so a huge share of my books are ebooks! Great post! I’m also definitely getting more and more books in ebook format than in physical format lately! As much as I love physical books, they’re just not always possible or handy. What a cool post! I used to be a huge e-book fan but now I personally don’t like reading them anymore. I can definitely see all the advantages tho, and I’m really glad they exist! I used to be a bit of a book snob. I refused to use an ereader because I liked having the physical copy of the book in my hands or on my shelves….and the new book smell, dreams of having a library that would rival Belle’s, etc. lol! My husband bought me an ereader even tho I told him I really didn’t want one….and I loved it! I read almost everything on my Kindle now. It gives me less headaches/migraines when I read from it and I don’t have to worry about the stress of having to donate books because I’ve run out of space. lol! Oh I know the feeling! I don’t find many books i want here in bookstores and only option is to order online! And yes about sneaking in reading!! It’s not easy to carry physical books everywhere!! Also I like to read when I eat and I can’t handle if I end up dropping food on my books! GOD FORBID!! 😛 I do have a lotta books on my Kindle app and I read them more than my physical books!! And yes! Less space!! Very important Lindsey 😛 Great post!! Uma @ Books.Bags.Burgers. recently posted…For the Love of Writing #1 – Meet the ‘writer’ me! I also used to hate the idea of ebooks – but once I moved abroad then started travelling, ebooks became my lifeline to the bookish world. Love this post, Lindsey! I totally agree with ALL the reasons you mentioned. I definitely I prefer reading ebooks to physical books because they’re so much more convenient. Living in the middle of nowhere it’s not always easy to get books and I’m also REALLY impatient so as much as I love book mail it’s great to get a book instantly ? It’s so much easier to annotate too. I do love buying physical books though because they’re sooo pretty. I’ve actually gotten better at reading physical books since I started blogging, but I think I still prefer ebooks. Yes, I completely relate! I still love physical books too, and I will always like to have my favorites in physical format 🙂 but I’ve definitely opened my eyes to the wonders of ebooks as well! I used to be anti- ebook too (or more accurately I just didn’t care to try them), but now I buy so many books as ebooks mainly for price (and I seem to read ebooks faster). For books that I really love though I often get a physical copy just so that I have it. “Opening book mail feels like a party”. love that! I’m totally with you on this. I used to be major anti e-book but now I love them, especially when you can catch those amazing $1.99 deals at Amazon. I also love the convenience of being able to carry around as many books as I want on my e-reader. Glad I’m not the only one to have recently discovered the wonders of ebooks 🙂 The amazing deals and the convenience are definitely some of the best things about them! Thanks so much! And haha, yes being able to sneakily read in public on the phone is definitely such a huge advantage 🙂 Though you’re right, nothing will beat the beauty of actual physical books! I absolutely appreciate both, but goodness, I think in general people underestimate the positive sof ebooks ESPECIALLY that they’re cheaper. I can buy two ebooks for the price of one hardback. i’M totally flying the ebook flag, nods. Definitely! 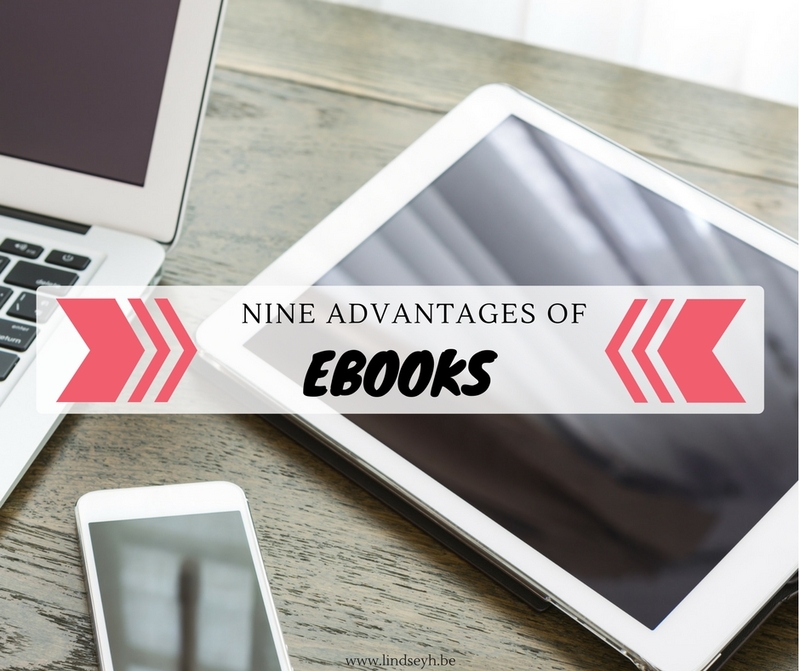 Ebooks and physical books both have their advantages, but ebooks tend to be most underestimated.